Many of us see ourselves on a journey through this life, looking to be better people, more valuable to those around us, and more purposeful. On this journey, I have noticed that true integrity is hard to find, and challenging to live. And, yet, we all have the utmost respect for those who hold to an unmoving standard of doing the right thing. Some would say that integrity is something you have. I have come to believe that it is something you choose. We can choose to have integrity, and choose to do the things that build our integrity. Integrity is simple as many good things are, but that doesn’t mean it is easy. To me it means choosing the right, honest and true thing, even to your own hurt, embarrassment, or guilt. 1. Is my motivation right? Integrity is a quality of being, and often we fool ourselves into thinking that we have it. True integrity is incorruptible. This means that we will do the right thing, even if it is not convenient, comfortable, or even looks like it will not produce good results. True integrity cannot be motivated by self-interest. If I have integrity, I don’t do what is right because it benefits me. I do what is right simply because it is right. Integrity, when tested, sets its own benefit aside to adhere to what is right. It is a deep inner commitment that does not waiver from its code. 2. Do my thoughts exhibit integrity? Sometimes we choose to say or do what is right, even though our thoughts are actively thinking the wrong thing. Making this purposeful choice is a good thing, but ultimately, we want our thoughts to line up as well. To change who we are, we have to fill our minds with the right things. Zig Ziglar famously said, “Your input determines your outlook. Your outlook determines your output, and your output determines your future”. To change ourselves so our thoughts line up and our actions are a natural outflow, it often requires changing our mental channel. Instead of filling our minds with junk, we must put our minds on a healthy diet. 3. Do I do what I say? A person of integrity will insist on meeting their commitments. This insistence may force one to learn, because good intentions don’t necessarily produce the right results. For instance, I may commit to certain actions during a meeting, but if I have not learned to take notes, transfer tasks to a calendar slot and set aside to work on them, and then actually have the discipline to work on them, my integrity is in question. Interestingly enough, if you are committed to doing what you say you will, it changes what you say you will do. We begin to weigh more carefully whether a task is important and whether it will fit with our other commitments. 4. How do I spend your free time? Often, you can measure your integrity by how you spend your free time. What do you watch? What do you read? How do you play? We are all intrigued by the train wreck on TV or in our news feed, but what you fill your mind with is bound to come out in your words, thoughts, and actions. It is hard to keep a positive attitude when you feed on the negative. Replace the negative with learning or volunteering in a way that helps others. You will be amazed at the difference it will make. 5. Do I start from a position of trust with others? People who have an underlying distrust for others often do so because they are not trustworthy themselves. We assume that others are like us. If I do not have integrity, then I assume that others lack integrity just like me. This isn’t always true, some have been hurt so deeply by others that they have a hard time trusting. However, if you find yourself starting from a point of distrust with people, consider your own level of trustworthiness. Try to wipe the slate clean and start with trust. Sure, we have to use good judgement, but when we start by trusting others, they have a chance to live up to our expectations and great things can happen! Self-interest is the enemy of integrity, so be on guard. When we choose contrary to integrity, we act to protect ourselves. We operate from fear rather than purpose. We choose to hide the truth and protect ourselves. We choose the easy path, rather than the right one. 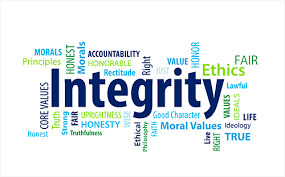 Is integrity part of your company values? Is it part of your personal creed for living? Our nature is to live for our self, and integrity sometimes seems contrary to that. However, living with integrity, in the long run, always produces a richer and better way of living.